Seperate Jacket with Hood and Waterproof Trousers. Including Jacket (with hood) & Trousers. 2 side pocket slots on trousers to access clothing underneath. Elasticated waist on trousers. Adults Waterproof & Windproof Suit. 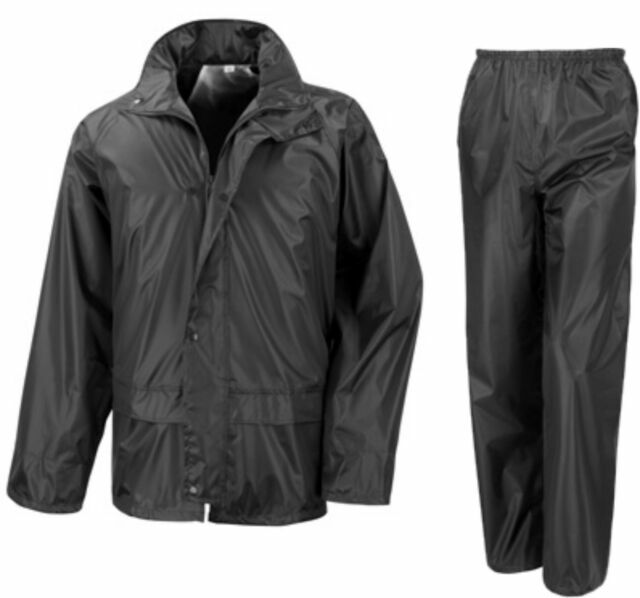 This Waterproof Suit for adults consists of a rainproof jacket and trousers in large size. The black waterproofs are heavyweight and feature taped seams and an integrated, elasticated hood. The waterproof suit from RSC has a full front zip fastening, two large front pockets in the jacket, and side pocket slots on the trousers so under trouser pockets can be accessed. The waterproof and windproof suit can be folded into a rucksack when not in use. A good quality waterproof suit for a reasonable price. I had priced up waterproof trousers and they alone were dearer than buying this suit. It arrived quickly, well packaged and I am now ready to brave the English summer. god value, quality and does the business water proofing.